Below is a photo believed to be of Spanish American War veterans taken in Albuquerque, New Mexico. The man standing just to the right of the left cannon (with a small "x" over his head is John D. Wagner (1st U.S. Volunteer Infantry - "Rough Riders" - Troop M). John W. Vandagriff (Arkansas 1st Reg't Infantry, Co. 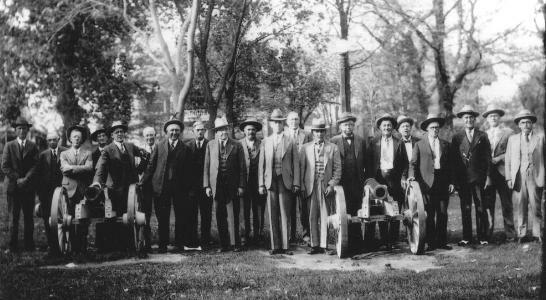 I) is the tall man with the hat in the front row, the second person to the left of the cannon. If you can identify anyone in this photo or provide any information on it, please contact us! Thanks to Pauline Vandagriff Laughlin for identifying her grandfather in this photo!